GoEco is a locally owned cleaning business in Tauranga , NZ that provides a wide variety of cleaning services that ranges from pressure washing of household & commercial exteriors, to oven cleaning in residential kitchens. We believe in the welfare of the environment and thus use cleaning chemicals that are verified as "Eco Friendly". This is because we at GoEco wish to ensure that our work strives for quality while being safe for anyone and anything in our surroundings. Hi, my name is Vineel Raj and I am the owner of the GoEco Cleaning Services. I started this business in 2015, here in Tauranga and offer Carpet Cleaning, Window Cleaning, Oven Cleaning and Water Blasting Services. With over 7 years of cleaning experience, my goal is to use 100% natural cleaning products that is safe for your family and the environment. Cleaning Mean and Keeping it Green We at GoEco Cleaning Services aim to provide affordable cleaning procedures using clean and green methods. Servicing the Tauranga area, from Bethlehem to Papamoa, GoEco Cleaning Services offer everything from window and carpet cleaning for residential homes to office and commercial cleaning. Using 100% eco-natural products, our professional staff have a strong focus on producing exceptional results every time. Whether you’re in need of a helping hand to get the house sorted before a special occasion, or needing the exterior looking sparkling again, Goeco Cleaning Services will ensure your home or business looks as it should. Covering the Tauranga area, from Bethlehem to Papamoa and everywhere in between. 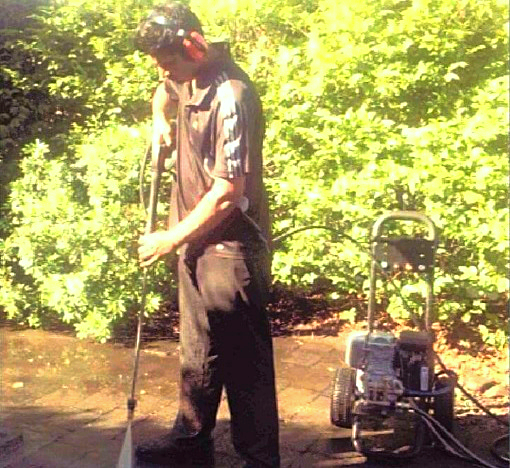 We provide power washing of household/building exteriors with industrial grade equipment. And we never miss a spot. Using eco-friendly cleaning solvents, we at GoEco ensure that you have a clear view of the outdoors. Using both hot and deep cleaning methods, we ensure that your carpets and rugs look as good as they did when you got them. Got Grease? GoEco ensures that your ovens are 100% grease and stain free, all while keeping it eco-friendly. We understand that you have commitments and deadlines, therefore we at GoEco assure you that we are always on time to get the job done. We use cleaning solvents that won't harm a fly (literally). Our cleaning techniques ensure that the chemicals are neither dangerous, or a hindrance to you, your family, and your environment. We love the job! And will ensure that you get nothing but the best for an affordable cost. Over one thousand satisfied customers in Tauranga. As a business owner and mum of two. I always struggle to find the right cleaning servies in Tauranga. One of my friend recommended me GoEco Cleaning Services in 2015, hesitantly agreed to Window cleaning. Now I am happy to recommend them for anyone who needs their services. I have used GoEco Cleaning a few times now to wash my home, oven cleaning and window. I could not believe how new and clean my oven looked after he completed it. I would recommend his service to others as he offers very reasonable price. Vineel has a cheerful personality and has a wealth of knowledge in clean green products. I found him very easy to talk to, his work ethic is impeccable. We are using GoEco Cleaning Services from 2015 for our Windows and Carpet Cleaning. I would suggest GoEco Cleaning Services for anyone, who are environmentally conscious. Contact us in confidence for a free, no-obligation quote. Copyright © 2018 GoEco Cleaning Services, New Zealand.